The Alleson Youth Blade Football Jersey is made of 100% eXtreme mesh Cationic colorfast polyester with moisture management finish. The full length “Elusive Cut” jersey is a v-neck with sleeve cuffs, “tri-cut” lycra side inserts and spandex side inserts (85% polyester/15% spandex). Buitl for comfort, moderately loose fit through body of the jersey with shorter sleeves and tailored yoke for a snug fit over the shoulder pads. The jersey is designed with double thickness dazzle yoke with single ply middle sleeve and tricot mesh body. 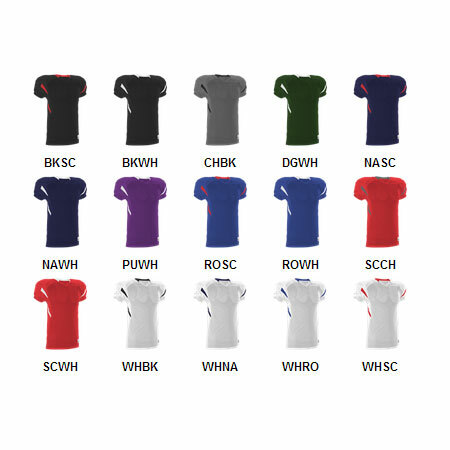 The two color jerseys have contrast color side inserts, sleeve inserts, and back collar. It also has a cover seamed throughout for additional strength and appearance. Sizes: YS-YXL.